Having a well stocked and organised freezer means that you can always lay your hands on enough ingredients to make a tasty and nutritional meal for the family. There is a plentiful variety of frozen vegetables to be found in freezer centres and supermarkets. Always have a bag of each type of vegetable that you family enjoy eating as they are easily cooked whilst you are preparing meat or fish as an accompaniment. Purchasing an inexpensive steamer will mean that you can quickly prepare the frozen vegetables as boiling will lose more of the nutritional value and softer vegetables will disintegrate. Why not put lots of different vegetables together you do not need to have a separate pan for each vegetable but just remember that more solid vegetables such as carrots may need a slightly longer cooking time. If you really do not have enough time to prepare meals for the family and freeze them for future use it is not a crime to have some purchased ready meals in your freezer. Check that the items you purchase are not full of fat and additives. Frozen fish, meat pies and raw meats such as chicken and burgers can still be nutritionally good for your family if served with plenty of vegetables and not deep fried or served with fatty chips all the time. There is a big market for ready prepared frozen diet meals. With choices as diverse as oriental food, curries and favourite English dishes it is easy to fall into the trap of relying on these foods to feed yourself or your family. These meals, although quite adequate tend to be small portions which could lead you to break your diet later in the evening. Try adding vegetables, new potatoes and follow with fresh fruit and yoghurt to make the meal more filling and appealing. These days many people try to grow some of their own food. The problems that occur when growing your own vegetables are that you suddenly have a glut of the same type of food. 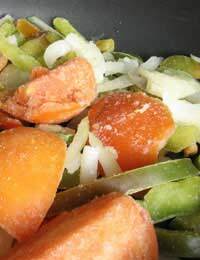 It is easy to freeze down vegetables just wash peel and chop as you would when cooking a meal. Have a large pan of boiling water ready and plunge the vegetables into this for three minutes. Remove, drain and then plunge into iced water for the same amount of time before draining and placing in containers for freezing. You will find that some vegetables can be chopped and frozen without any other preparation as long as they are used quickly. You may not grow your own herbs but did you know that you can now purchase freshly frozen herbs? Also, if you tend to purchase fresh herbs and do not use them all in one recipe you can chop the remaining herbs, place them in a freezer bag and pop them into the freezer to be added at a later date to a casserole or stew. You may think this is cheating but items such as chopped onions, sliced peppers and even garlic can be bought ready frozen. For someone with a busy life why not use these products if it means that you are able to dip into your freezer and find all the ingredients freshly frozen and waiting to be made into a delicious tasty meal for the family in no time at all?